How much field-aligned electromagnetic energy flows from the magnetosphere to the ionosphere, at which scales into each hemisphere? Ivan graduated with a Master’s degree in Aerospace Engineering at the University of Sheffield, United Kingdom, and went on to finish a PhD at the same university in Space Systems under the Automatic Systems and Control Engineering department. Working in Prof Michael Balikhin’s research lab, he studied electromagnetic ion cyclotron waves using the ESA Cluster mission and developed and validated new approaches to radiation belt modelling, combining data-driven and physics-based approaches. 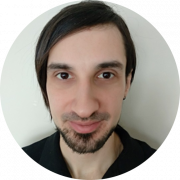 After graduation, he has been working in Prof Ian R Mann’s group at the University of Alberta, Canada, from 2015, initially working on an ESA Swarm+ Innovation project investigating the impact of Alfven waves in magnetosphere-ionosphere coupling (MIC). The work on wave processes continued under a Canadian Space Agency grant, where they were able to publish evidence that Alfven waves are a fundamental part of field-aligned current systems. With the development by ESA of years of statistical E- and B-field data products collected by the Swarm mission, he applied to the ESA Living Planet Fellowship to determine just how energetically important Alfven waves really are in MIC dynamics. The main objective of the project is to obtain a statistical characterization of the relative influence of various scales (small, meso- and large) of electromagnetic field-aligned energy on magnetosphere-ionosphere coupling processes. Forsyth, C., I. J. Rae, I. R. Mann, and I. P. Pakhotin (2017), Identifying intervals of temporally invariant field-aligned currents from Swarm: Assessing the validity of single-spacecraft methods, J. Geophys. Res. Space Physics, 122, 3411–3419, doi:10.1002/2016JA023708. Pakhotin, I. P., Mann, I. R., Lysak, R. L., Knudsen, D. J., Gjerloev, J. W., Rae, I. J.,… Balasis, G. (2018). Diagnosing the role of Alfvén waves in magnetosphereionosphere coupling: Swarm observations of large amplitude nonstationary magnetic perturbations during an interval of northward IMF. Journal of Geophysical Research: Space Physics, 123. https://doi.org/10.1002/2017JA024713. Miles, D. M., Mann, I. R., Pakhotin, I. P., Burchill, J. K., Howarth, A. D., Knudsen, D. J., … Yau, A. W. (2018). Alfvénic dynamics and fine structuring of discrete auroral arcs: Swarm and e-POP observations. Geophysical Research Letters, 45. https://doi.org/10.1002/2017GL076051.